Amazing mural. That's my nephew Benn, my mom Elaine, and my Aunt Sandra. 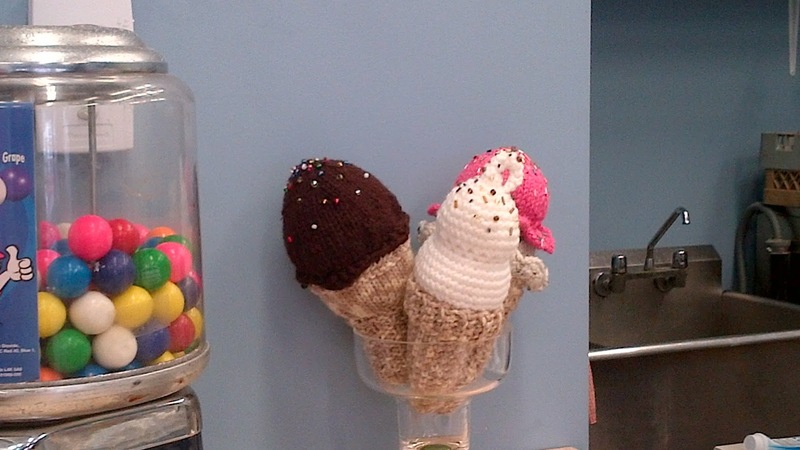 Did you want to have your own icecream shop when you were a child? I certainly did, though I have not actually acted upon that wish. My cousin and her husband did. 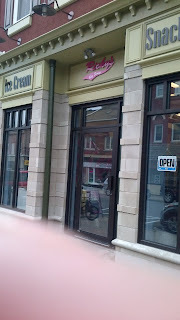 A few years back they made the big leap and are now scooping icecream every day. 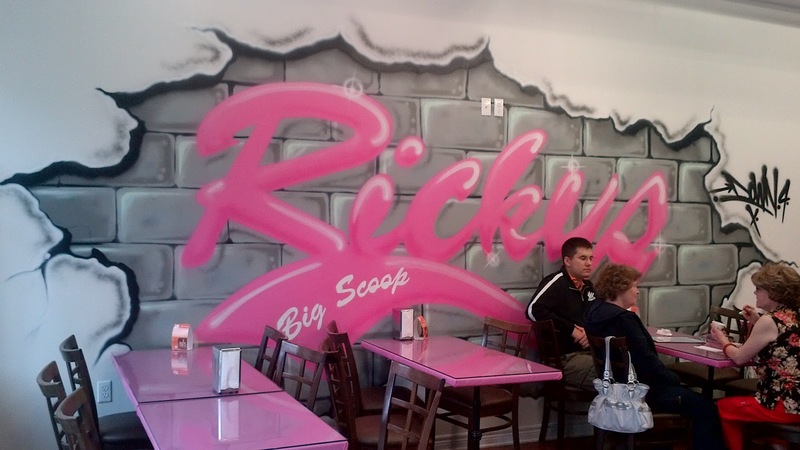 Join me while we visit Ricky's Big Scoop for cones and bowls of fresh made soup and garlic bread. The shop is located on Front Street, in Thorald, Ontario. Easy to find and lots of free parking in the vicinity. My parents have been visiting the shop since it opened, but this was my first visit. Too bad we live so far apart or I'd be a regular. Full menu. Ricky makes his own gelato. Comes in regular, sugar-free and dairy-free versions. 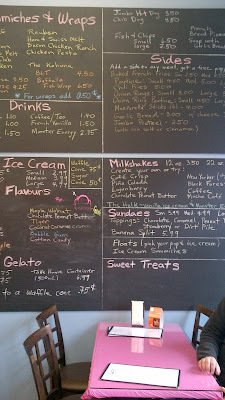 I had some dairy enzyme with me that day, so I enjoyed a dairy version of gelato. Excellent. After icecream, it was time to eat. yes, my mom was with me d she was all for eating dessert first. 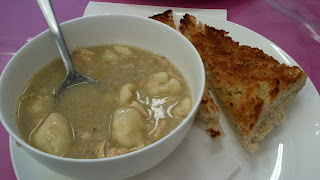 Chicken dumpling soup with fresh baked garlic bread. Ricky bakes bread 2-3 times a day, depending on demand. After eating the garlic bread, I can understand the demand. I am not big on bread, but this was delicious. 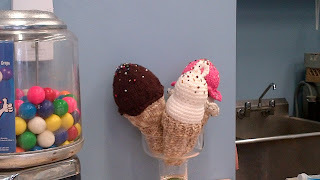 My regular readers might recall that I crocheted and knitted these icecream cones for my cousin's bridal shower. 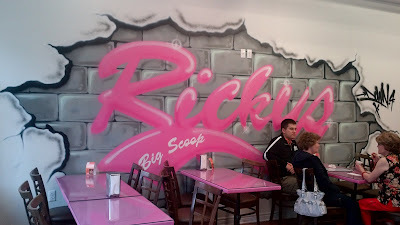 Want to learn more about Ricky's Big Scoop, visit his website where you can "like" him on Facebook or get his twitter feed. Even though I don't visit often, I love getting daily notices of which soup is available, daily specials and new icecream and gelato flavours. An app is also available for Playbook users. Did I fail to mention the giant Poutine challenge? 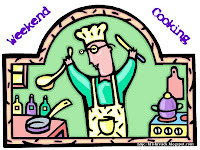 For further foodie fun, be sure to visit Beth Fish Reads for her Weekend Cooking meme. I should order dessert first more often when I'm out to eat - I think it would make life more interesting! This looks like a great place - if I'm ever in Ontario I'll try to visit! What a lovely day! Ricky's sounds like a fabulous place to visit. I'm not sure what I want more--that yummy soup/bread combo or the gelato. Delish!! Fun! 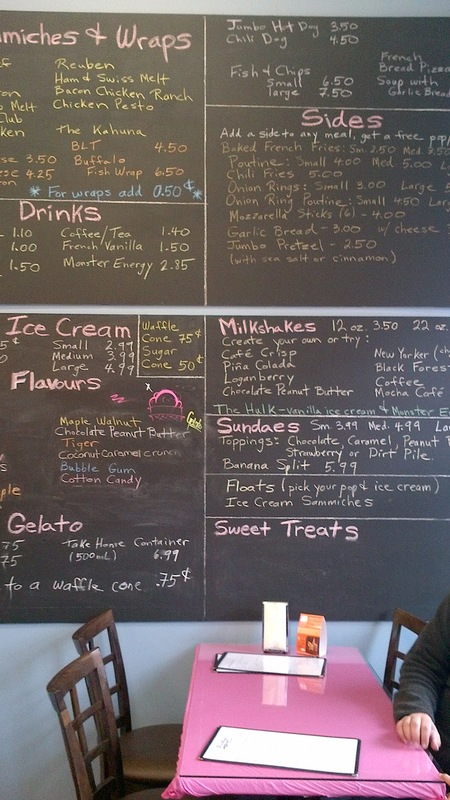 I love the colors and the chalk board menu. 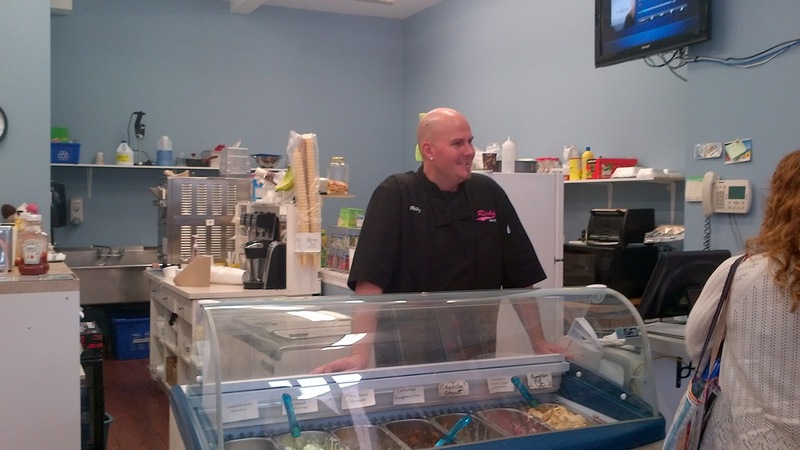 what a fun job-I would love to make ice cream all day long-what is your favourite flavour? Along with a sweet shop this must be my dream job. As much as I love garlic bread, I'm afraid it would have to be ice cream for me. Next time I'm in Ontario, I'll have to stop by. Sounds fantastic!